In Chapter 3: Mathematicians Take Risks, Tracy invites us to follow her lead and take a risk in a manner similar to a student she documents in a classroom vignette. She suggests that we play with 10. I liked the idea, but was feeling pretty tapped out on risks related to 10, having explored that territory in great detail and complexity over the last ten years. So I read on with Tracy’s challenge in the back of my mind. In a seemingly unrelated episode, Tabitha (9 years old) was doing some homework this week and needed to know the product 7 times 8. Spouse was offering a hint: It starts with a five. I asked Tabitha if she knew what 10 sevens is, which led to her expressing 7 x 8 as 70 – 14. The next day I was thinking about Spouse’s hint. It starts with a 5. What math might there be in that relationship? Could I develop a way of knowing what a product starts with? With Tracy’s voice in my head, I took a risk. I now take a bigger risk by sharing my ideas with you. If you’re multiplying 7 by 8, the product starts with a 5. This is two less than the multiplier, 7. The same is true for 8 times 8 (starts with 6) and 9 times 8 (starts with 7). 11 times 8 starts with an 8, though. If you look more deeply, you’ll notice that the difference between the tens digit (what the number starts with) and the multiplier increases by 1 for every group of 5 in the multilplier. Try 22 times 8. 22 has four groups of 5, so 22 times 8 starts with 17 (which is 22-4, minus one more because 1 times 8 starts with a zero). The opposite rule applies to twelves. Every five twelves, you need to ADD an extra unit to what the number starts with. 13 times 12 starts with 15 because there are two groups of five in 13. There are exceptions. 25 times 8 has me stumped. It should start with 19, but does start with 20. This is much more complicated. You can get a good approximation by counting groups of 10 in the multiplier and adding three to the difference between starting digits and multiplier for each group of 10. But you’ll get a lot of exceptions. 71 works. Seven 10s, times three gives you 21, plus one is 22. 71-22 is 49, so we expect 71 x 7 to start with 49, and it does: 497. But 78 fails. My rule predicts that 78 x 7 starts with 56, but it doesn’t. 78 x 7 = 546. The failures seem to be predictable, though. So I’ll press onwards. I haven’t yet decided whether 7 is different and difficult because of its 7-ness, or because of the fact that it’s 3 away from 10. The three for every ten bit makes me think it’s probably the threeness of seven that matters rather than the sevenness. But I don’t know that yet. Please don’t answer these questions for me. They are mine. Explore them if you find them compelling. Don’t spoil my fun. I made my favorite pumpkin muffins this morning, for the first time in quite a while, but I made them differently today. The recipe calls for one cup of pumpkin from a can. A can of pumpkin contains about a cup and a half, and what are you gonna do with an extra half cup of pumpkin? So I always put in the whole can. Today however, I was using pumpkin from the freezer. Last fall, I turned a couple of pie pumpkins into pumpkin puree and froze it for exactly this purpose. The bag of pumpkin puree I was working with contained two cups. So I made two batches, using the prescribed one cup per batch. They are good, but they are not quite as good as the ones that have a cup and a half of pumpkin. If you spend any time baking, you will surely run across claims that baking is different from cooking. Baking requires more precision and following of directions than other types of cooking, you’ll be told. Similarly if you spend any time learning math, you will surely run across claims that learning math is different from other intellectual activities. Learning math requires precision and following of steps, you’ll be told. These are lies. My deliciously moist pumpkin muffins prove that this is so. This is what I love so dearly about Eugenia Cheng’s book How to Bake Pi.. She writes that in both math and baking, decisions have consequences. Sometimes these consequences are undesirable, such as bread that doesn’t rise or arithmetic that is inconsistent. In math as in baking, you need to follow instructions carefully in order to achieve the known result. If I want muffins that are exactly like the ones in the original recipe, I need to use one cup of pumpkin. But here’s the secret we don’t let you in on: If I use the whole can of pumpkin, I will still get pumpkin muffins. They will be different ones, but they will still be pumpkin muffins. The difference between baking and math is that you nearly always see the natural consequences of the decisions you make, while we structure most people’s experiences with math in ways that hide those consequences. If you leave out the sugar, your muffins will not be delicious. They may have structural problems as well. You notice these consequences and you tend to try to figure out what went wrong. If you claim that , the only consequence is that someone else tells you that you are wrong—whether teacher, tutor, or back of the book. In Cheng’s book, she describes treating math exactly like baking. She pushes her students to consider the natural consequences of their claims. If , then when , . If , then there are going to be lots of troubles later on. Go read her book. Then make some pumpkin muffins. And please don’t listen to Chris Kimball; the man is a total killjoy. I have many wonderful books to recommend. Not least my own. If you’re reading this and do not own a Teacher Edition for Which One Doesn’t Belong? I need you to fix that situation before reading further. Because clearly you’ve found value in the words and ideas on this site, and the book is a better, more focused version of those ideas. But I’m not here today to push my book. No, I’m here to get another thing on your reading list. First a prelude. People (well some people, who are not me anyway) like to carry on about differences between elementary school math and high school math. When they do, they fall into one of two camps. You have to commit the facts and techniques of arithmetic to memory before you can use them to think, and to do real math. You can play around with the early, intuitive ideas of math, but when you get to algebra (or trigonometry, or calculus, or whatever) the game changes and you need to be told stuff. Then you need lots of practice with what you’ve been told. That these two make opposite assumptions about elementary math, and also about secondary math should suggest to us that people are just choosing to look at things from a perspective rather than describing the true nature of the discipline. Whatever the eventual fate of the Common Core State Standards for Mathematics, hopefully one of its lasting legacies will be an understanding that mathematics as a discipline is more than content, and that this should be represented in school mathematics. Where this appears in the standards is the Standards for Mathematical Practice (SMP). An important thing to know about the Standards for Mathematical Practice is that they pertain across all levels of mathematical activity. These are K—12 standards, but they describe the kinds of activity that distinguish math as a discipline. When I wrote about the Standards for Mathematical Practice on this blog, and in the Dummies book, I took the easy way out. I addressed their spirit without going into all eight of them in depth. But I’m here today to tell you that Mike Flynn has taken the high road and done the much more challenging job of treating each of these standards right. Flynn structured his book Beyond Answers around the Standards for Mathematical Practice—one chapter per standard. He illustrates each with a vignette from his own life demonstrating the utility of the practice in his own daily life, with vignettes from classrooms, and with clear writing demonstrating the very real and important mathematical work of which young children are capable. On its surface, this is a book about elementary children doing mathematics. But it’s really a book about people doing mathematics. If you’re a secondary or post-secondary teacher, and you read this book without seeing important connections to the work that you do, I’ll buy you a cup of coffee so we can talk about that. Ultimately, my own critique of the SMP was about them being too numerous to remember, and about them overlapping in ways that make it difficult to communicate their individual importance. I still have those critiques. Flynn doesn’t convince me (nor does he try) that this is the perfect set of such standards. But he doesn’t need to do that. These are the standards we have. They resonate at all levels of mathematical activity, and in Beyond Answers, Mike Flynn shows convincingly that young children’s mathematical work is not fundamentally different from that of older students. Mathematics as an intellectual discipline is alive and well. This is Awesome Stuff Other People Have Made Week on Overthinking My Teaching. So much great stuff to share. First up is a Kickstarter campaign from Edmund Harriss, who makes beautiful and brilliant things. His coloring book Patterns of the Universe was part of the Summer of Math. He invented a new spiral. Anyway, Curvahedra is a system of pinwheely spirally things that attach to each other in a simple and clever way, and which then allows you to build strange and interesting 3-dimensional objects. 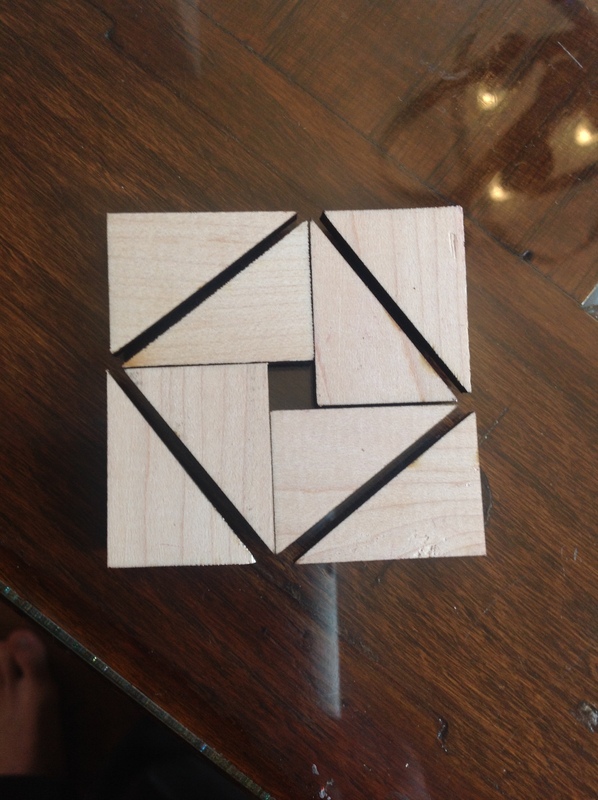 He brought samples along to Twitter Math Camp this past summer, and they are clearly quite wonderful. If you are able, you should throw 10 bucks or more into the pot over at Kickstarter so you can play along when they ship next spring. Or will the MTBoS Blogbot be unable to notice a self-referential blog title? A while back, I wrote about information that Dreambox and XtraMath send to parents about their child’s progress. Now I’d like to share some more actual feedback, but with a different contrast, brought to my attention by an alert reader. I will keep the source anonymous by request. Consider these two year-end summaries, both for the same child. One is by the child’s regular classroom teacher, and the other is by the child’s math teacher. This is a school where children are shuffled for math instruction. [Child] has worked hard in third grade to increase her literacy skills in becoming a life-long reader and writer. She’s a mindful reader when choosing books of personal interest and challenge level. She reads with superb confidence and stamina. As a reader and writer of nonfiction, [Child] researched an animal of interest and published a book that demonstrated expertise of the topic. She crafted nonfiction text features that reflected her individual voice. She read and analyzed poetry—then applied the tools of a poet to craft individual poems. Wow! You’re an amazing reader and writer! Way to go, [Child]! [Child] has made progress in math this year. She should work on learning her basic subtraction and multiplication facts over the summer. I have enjoyed having her as a student! Have a wonderful summer, [Child]! I understand that these are different teachers, and I understand that [Child] probably spent quite a few more hours with the literacy/home teacher than the math teacher. But I don’t think those are the major things at play here. The difference in the richness of the description of [Child]’s current literacy and growth from the description of [Child]’s mathematical knowledge and growth reflects the ways we view these two subjects in American schooling. Throughout my own children’s elementary schooling, I have seen deep and rich attention paid to their learning to read and write, and surface, fact-based attention paid to their learning math. Literacy is about power and beauty and self-actualization. Math is about memorization and speed. These are the ways we represent these subjects to parents, teachers, and children. I was at a table full of kindergartners playing with triangles, trapezoids, and concave hexagons. We were building and chatting. They wanted to know if I wanted to hear them sing in French. I said yes. The sweetest two minutes ensued as this table’s Frere Jacques spread to the next and then the next, and soon the whole classroom was singing and doing math. A few minutes later I made this. And then I went scrambling for my notebook. Yup. Sure enough. is equivalent to the Pythagorean Theorem.